Supporting everyone involved in the nail art community is what makes it so strong and cooperative. 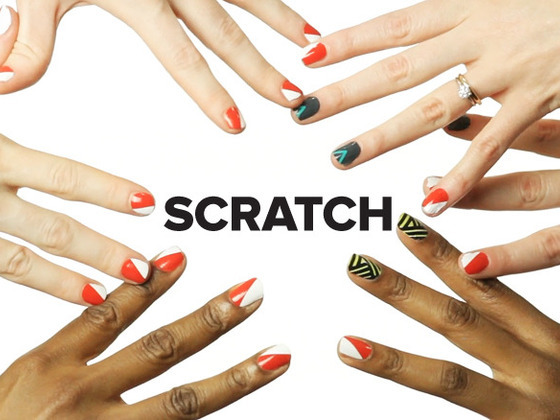 I'd like to show my support for Scratch, a new brand of nail wraps focused on good design. I personally haven't tried the wraps, seen the wraps, or heard anything about them besides the email Kim sent me asking for my help in getting the word out about the new company, but I see this being a promising endeavor for everyone involved. The wraps look much easier to apply than Jamberry. Peel, stick, go. What could be simpler? The creators of Scratch need help and funds to get their project off the ground and to your tables. Pledge some money and back this project through their Kickstarter page. Pledges will not only help them, but also get you some sets of wraps. $6 enters you into a random drawing for a set, $11 guarantees you one set, and everything beyond that just gets bigger and better for everyone. I appreciated the hard work and design idea behind this little company, so that's why I chose to share them with you guys. Just check out their video below. It's so quirky and put together so well, I couldn't say no. So lend your support to these design-savy ladies. I can't wait to see what this has in store if it gets off the ground. You can learn more about Scratch at their Facebook page, by following them on Twitter, or by browsing some of their inspirational pictures on Pinterest. Definitely stop by their Kickstarter project and offer any pledges you have, whether that be $6 or $10,000! Thanks for sharing! I love the cute video!